After going through so many ups and downs last February, I realized that life wasn't so bad after all. Time indeed flies so fast. The first quarter of 2017 will soon be over. I want to rest from more hardships this month; so, I told myself that I'm going to stop over thinking and my negative thoughts. My dad cannot afford to walk all day as he gets tired so easily. Aside from that, he falls asleep at any given time so it's really difficult to make a plan. That's why my family prefers to have our food delivered in our condo, than go out then dine at a restaurant. I set a lunch date with them day after my dad's trip to the hospital. Thankfully, our lunch out happened! My dilemma the past few weeks was I wanted to move out of my earlier apartment because I felt unsafe in the neighborhood, but I wanted to save my money on rent as well. I just moved to a new apartment last week, right before our trip to Cebu. I have only been sleeping there for 3 nights, and so far so good! There's a 24-hour store at the front, restaurant and food stalls below our unit, we have our own bathroom, the room is more spacious, lastly, it feels safer. My high school friends and I had our most awaited trip to Cebu. I know I have talked about this in my earlier posts. I enjoyed the entire trip despite not having enough sleep. We always had to wake up at 3 AM, and we faced several adventurous activities. Obviously, my posts for the upcoming weeks are about this Cebu trip, so wait for it! Last Valentine's day, we had a double date with my boyfriend's parents. I find it cute that his parents are still sweet to each other. I gave my boyfriend a turtle stuffed toy, and he gave me a pig stuffed toy. I'm not really a fan of celebrating the day itself, but I enjoy seeing people showing their love to others on that day. I wish I could share it with you now, but I am still waiting for the results so I'm going to keep the details for now. It was November last year when I first received a call from this organization. I always doubted it, but I wanted to believe in it at the same time. Last January, I took a leap of faith and said, "why not?". I doubted it because I have to pay a huge amount of money. After some careful consideration, after talking to my parents and to different people, I am convinced. However, being a paranoid one, I started to over think and doubt again. I felt bad because I already started paying it. So, I sent an email to the person involved, the one who is collaborating with this organization, and guess what? He explained everything to me and confirmed everything! Yay! Two weeks ago, I'm not really feeling well. I always think that it would go away after a week, but my boyfriend told me that I should have went to the doctor if I'm still sick for 3 days. The problem here is it was going on and off - I thought I just needed to rest. Eventually, I listened and went to the doctor. I found out that it is not just a cold or flu, but it was something else (thankfully it's not dengue). Apparently, I had stomach flu which causes dehydration too! I am always craving for Jollibee! I only created an account in Twitter last year. I'm not as active as other people, but at least now I'm trying to be active on Twitter. What's good about this is I get to interact with more people too! During my free time, I always watch anime. But lately, I'm into Korean dramas. I started watching Descendants of the Sun (because Song Hye Kyo was the protagonist and I'm really a fan of her), then I just finished watching W - Two Worlds. Last weekend, I asked a question on Twitter on what I should watch first. Doctors or Goblin? Many suggested Goblin so I'm watching it now! I'll watch Doctors after I'm done with Goblin. I visited our dogs at my friend's house (he has my Pomeranian too) and brought chew bones for them to play with. I used to see them twice a week, but sadly, I only see them at least once a month. I'm happy that I still get to see the good things that happened to me regardless of the unfortunate events. To be honest, the news about politics is exhausting me and I just wanted it to settle soon. Or at least, read more good news. I wanted to blame my monthly visitor for letting me feel down, but I know that it wasn't the reason. Anyhow, these good things that happened to me make me think that life wasn't so bad after all. I still think that things happen for a reason! When life hits you hard, do you still see the bright side? 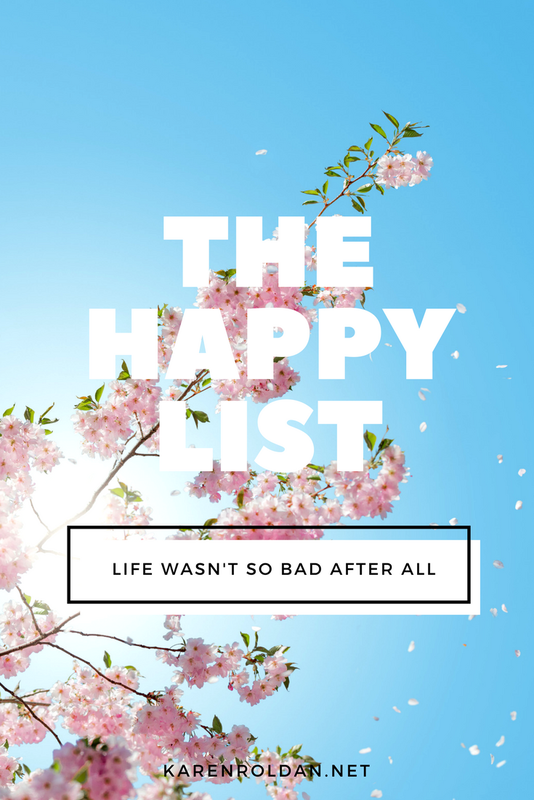 What are the things that are making you happy lately?